The following bulletin was first published by journalist Kenneth Lipp in a post on Medium. 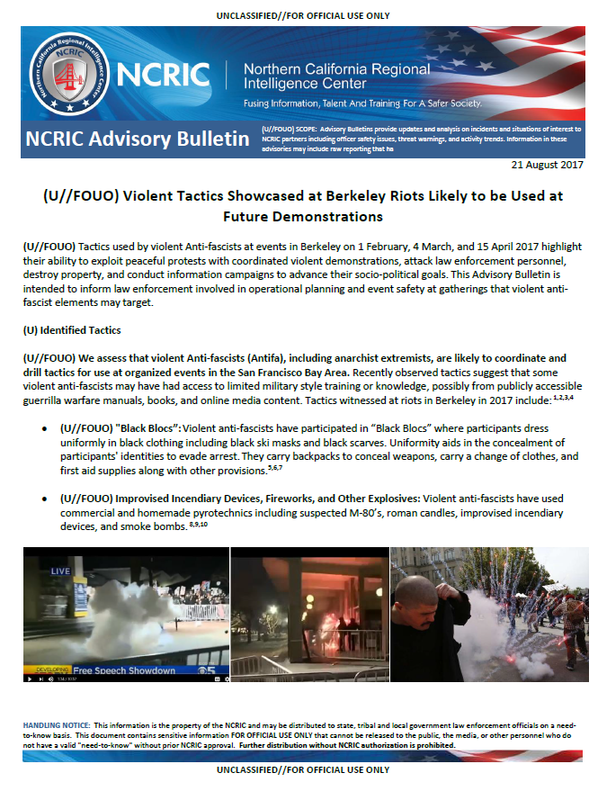 (U//FOUO) Tactics used by violent Anti-fascists at events in Berkeley on 1 February, 4 March, and 15 April 2017 highlight their ability to exploit peaceful protests with coordinated violent demonstrations, attack law enforcement personnel, destroy property, and conduct information campaigns to advance their socio-political goals. This Advisory Bulletin is intended to inform law enforcement involved in operational planning and event safety at gatherings that violent anti-fascist elements may target. •(U//FOUO) “Black Blocs”: Violent anti-fascists have participated in “Black Blocs” where participants dress uniformly in black clothing including black ski masks and black scarves. Uniformity aids in the concealment of participants’ identities to evade arrest. They carry backpacks to conceal weapons, carry a change of clothes, and first aid supplies along with other provisions. •(U//FOUO) Improvised Incendiary Devices, Fireworks, and Other Explosives: Violent anti-fascists have used commercial and homemade pyrotechnics including suspected M-80’s, roman candles, improvised incendiarydevices, and smoke bombs. •(U//FOUO) Improvised Weapons: Violent anti-fascists at Berkeley Riots have used improvised weapons including, but not limited to pipes, bricks, hammers, bike locks, rocks, wooden dowels, bear spray, pepper spray,boards, dumpsters, soda cans, and road and police barricades such as bike racks and barricades. •(U//FOUO) Area Denial: Violent anti-fascists have been observed gathering local materials to construct traffic obstacles. They have constructed roadblocks from road-improvement site materials,dumpsters, trash cans, cinder blocks and other unsecured materials including garbage. Violent anti-fascists occasionally set these materials on fire to divert first responder resources. Roadblocks deny access to first-responders by preventing traffic movement, further tying up resources. •(U//FOUO) Human Shields: Violent anti-fascists at the 1 February event at UC Berkeley limited law enforcement response options by intermingling with crowds of peaceful protestors. •(U//FOUO) Element of Surprise: Violent anti-fascists have avoided early detection at some events by assembling off-site before moving to a given venue, taking responding authorities by surprise. •(U//FOUO) Reconnaissance & Surveillance: Violent Anti-fascists appear to have used reconnaissance and surveillance to gain knowledge about event security gaps and infiltration opportunities. •(U//FOUO) Communication: Violent anti-fascists have used multiple, overlapping communication platforms including megaphones, phone apps such as Signal, rally markers such as flags, and command and response words to continue to coordinate their actions if one communication method is compromised or fails.